Whether you're a professional or a do-it-yourself owner, Bentley's comprehensive service manuals will help you understand, care for, and repair your car. If you aren't a do-it-yourselfer, you will find that still reading and owning a manual will make it possible to discuss repairs more intelligently with a professional technician. 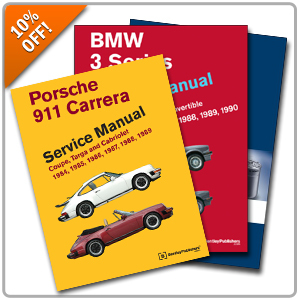 Now's your chance to own one of the best repair manuals on the market! From now until October 3rd take 10% off all Bentley Service Manuals when you apply the promo code BENTLEY during Checkout! With the popularity of this promo, we're extending it until 10/10! Last edited by Dmitry at Pelican Parts; 10-03-2018 at 04:14 PM. Last day to take advantage of savings! Promo ends today at 11:59pm PST.